While Alex Rodriguez sits on 599 career home runs, I recently noticed that I was also in the vicinity of 600. Six hundred Tweets, that is. In the spirit of A-Rod hitting a career milestone and my own willingness to participate in obscure, yet humorous, sports promotions, I too will sit on 599. That’s right–I’m not Tweeting again until Rodriguez goes deep. When I do, my 600th will be in honor of his. 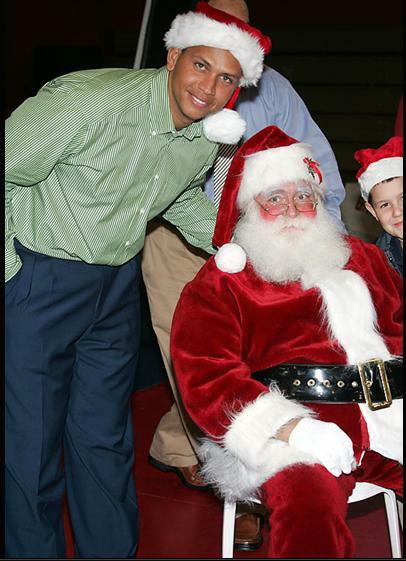 All I want for Christmas is for A-Rod to go deep Tuesday. Photo via SI. The MLB is using specially marked baseballs for A-Rod’s at-bats. YES had a great shot of the balls during today’s game, which appear to just have an “R” written on them (presumably for Rodriguez), along with the ball’s corresponding number to the set. Say what you want about the 600-club not mattering, but with his next blast A-Rod will become just the seventh card-carrying member in MLB history, and he will get there faster than anyone before him. So here’s to seeing history be made; well, I hope. SI’s Joe Posnanski has a good column about A-Rod and the 600-club.